J A Woollam Spectroscopic Ellipsometers for Thin Fillm Measurements - What is Ellipsometry? Ellipsometry, single wavelength ellipsometry or spectroscopic ellipsometry, is a method to determine layer thickness and optical constants of thin films or substrates. An ellipsometer, either a single wavelength or a spectroscopic ellipsometer, measures the polarisation change at reflection (or transmission in case of anisotropic sample). We offer a wide range of spectroscopic ellipsometers, optimised for your particular application. The flexible ellipsometer VASE, based on a scanning monochromator is ideal for all kinds of R&D applications, covering the widest spectral range in the market from 140 to 3200 nm, or in combination with IR-VASE up to 30 µm. Alternatively, Woollam’s fast CCD based, rotating compensator spectroscopic ellipsometers M-2000 and RC2 are available for ex-situ as well as in-situ applications. Woollam have also introduced the iSE which is designed specifically for in-situ monitoring of thickness and optical properties. Below is a basic guide to ellipsometry measurements and how the technique works. Answers to frequently asked questions about ellipsometry can be found here for those who already have some familiarity with the technique. This tutorial provided by the J. A. Woollam Co. is an introduction to ellipsometry for anyone interested in learning more about ellipsometry and its applications. This tutorial is written with the novice in mind, but experienced ellipsometry users will also benefit from the information presented in this discussion. Ellipsometry measures a change in polarisation as light reflects or transmits from a material structure. 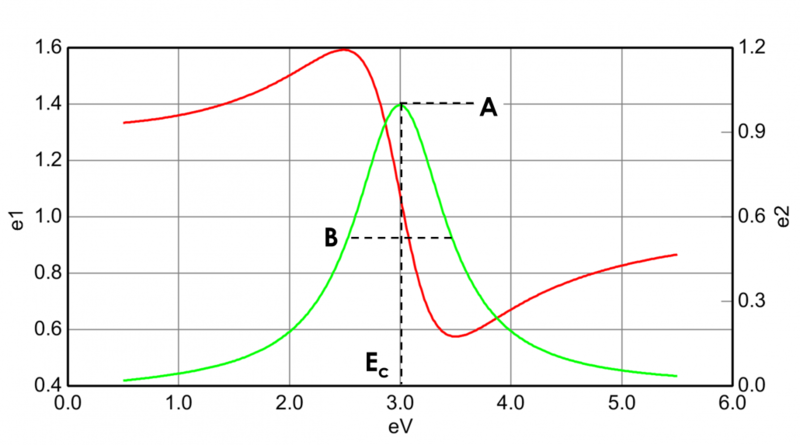 The polarisation change is represented as an amplitude ratio, Ψ, and the phase difference, Δ. The measured response depends on optical properties and thickness of individual materials. Thus, ellipsometry is primarily used to determine film thickness and optical constants. However, it is also applied to characterise composition, crystallinity, roughness, doping concentration, and other material properties associated with a change in optical response. Since the 1960s, as ellipsometry developed to provide the sensitivity necessary to measure nanometer-scale layers used in microelectronics, interest in ellipsometry has grown steadily. Today, the range of its applications has spread to the basic research in physical sciences, semiconductor and data storage solutions, flat panel display, communication, biosensor, and optical coating industries. This widespread use is explained by increased dependence on thin films in many areas and the flexibility of ellipsometry to measure most material types: dielectrics, semiconductors, metals, superconductors, organics, biological coatings, and composites of materials. 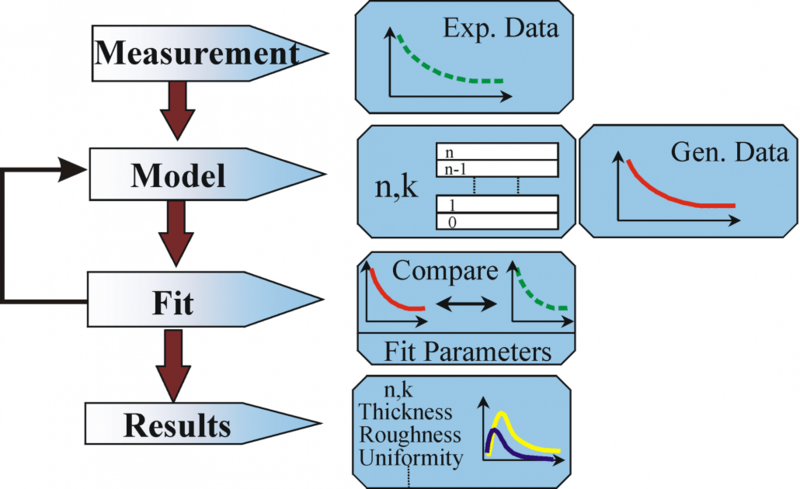 This tutorial provides a fundamental description of ellipsometry measurements along with the typical data analysis procedures. The primary applications of ellipsometry are also surveyed. Light can be described as an electromagnetic wave traveling through space. For purposes of ellipsometry, it is adequate to discuss the waves’s electric field behavior in space and time, also known as polarisation. The electric field of a wave is always orthogonal to the propagation direction. Therefore, a wave traveling along the z-direction can be described by its x- and y- components. When the light has completely random orientation and phase, it is considered unpolarised. For ellipsometry, however, we are interested in the kind of electric field that follows a specific path and traces out a distinct shape at any point. This is known as polarised light. When two orthogonal light waves are in-phase, the resulting light will be linearly polarised. The relative amplitudes determine the resulting orientation. If the orthogonal waves are 90° out-of-phase and equal in amplitude, the resultant light is circularly polarised. The most common polarisation is “elliptical”, one that combines orthogonal waves of arbitrary amplitude and phase. This is where ellipsometry gets its name. Thus, the extinction coefficient relates how quickly light vanishes in a material. These concepts are demonstrated in Figure 2 where a light wave travels through two different materials of varying properties before returning to the ambient. 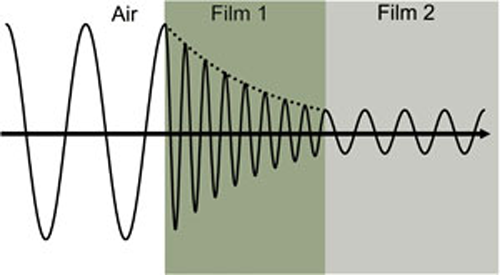 Wave travels from air into absorbing Film 1 and then transparent Film 2. The phase velocity and wavelength change in each material depending on index of refraction (Film 1: n=4, Film 2: n=2). The optical constants for TiO2 from the ultraviolet (UV) to the infrared (IR), as shown in Figure 3. The optical constants are determined by wavelength with absorption (k>0) occurring in both UV and IR due to different mechanisms that take energy from the light wave. IR absorption is commonly caused by molecular vibration, phonon vibration, or free-carriers. UV absorption is generally due to electronic transitions, where light provides energy to excite an electron to an elevated state. A closer look at the optical constants in the figure below shows that real and imaginary optical constants are not independent. Their shapes are mathematically coupled through Kramers-Kronig consistency. Complex dielectric function for TiO2 film covering wavelengths from the infrared (small eV) to the ultraviolet (high eV). Light reflects and refracts according to Snell’s law. The superposition of multiple light waves introduces interference that depends on the relative phase of each light wave. 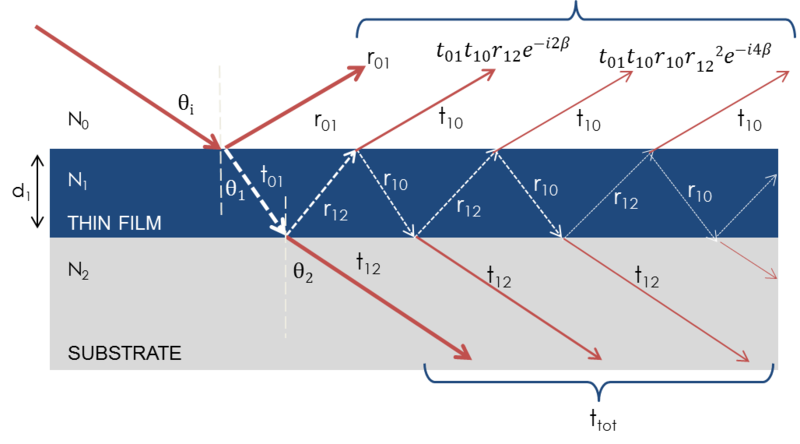 The figure below illustrates the combination of light waves in the reflected beam and their corresponding Fresnel calculations. Light reflects and refracts at each interface, which leads to multiple beams in a thin film. Interference between beams depends on relative phase and amplitude of the electric fields. Fresnel refection and transmission coefficients can be used to calculate the response from each contributing beam. A sample ellipsometry measurement is shown in Figure 6. The incident light is linear with both p- and s- components. The reflected light has undergone amplitude and phase changes for both p- and s- polarised light, and ellipsometry measures their changes. The primary tools for collecting ellipsometry data all include the following: light source, polarisation generator, sample, polarisation analyzer, and detector. The polarisation generator and analyzer are constructed of optical components that manipulate the polarisation: polarisers, compensators, and phase modulators. Common ellipsometer configurations include rotating analyzer (RAE), rotating polariser (RPE), rotating compensator (RCE), and phase modulation (PME). The RAE configuration is shown in the figure above. A light source produces unpolarised light which is then sent through a polariser. The polariser allows light of a preferred electric field orientation to pass. The polariser axis is oriented between the p- and s- planes, such that both arrive at the sample surface. The linearly polarised light reflects from the sample surface, becomes elliptically polarised, and travels through a continuously rotating polariser (referred to as the analyzer). The amount of light allowed to pass will depend on the polariser orientation relative to the electric field “ellipse” coming from the sample. The detector converts light to electronic signal to determine the reflected polarisation. This information is compared to the known input polarisation to determine the polarisation change caused by the sample reflection. This is the ellipsometry measurement of Psi and Delta. This equation assumes there are no surface layers of any type. However, in any bulk material, there is typically a surface oxide or roughness, and the direct inversion would include these as part of the bulk optical constants. The more common procedure used to deduce material properties from ellipsometry measurements follows the flow chart below. Regression analysis is required because an exact equation cannot be written. Often the answer is over-determined with hundreds of experimental data points for a few unknowns. Regression analysis allows all of the measured data to be included when determining the solution. The film thickness is determined by interference between light reflecting from the surface and light traveling through the film. Depending on the relative phase of the rejoining light to the surface reflection, interference can be defined as constructive or destructive. The interference involves both amplitude and phase information. 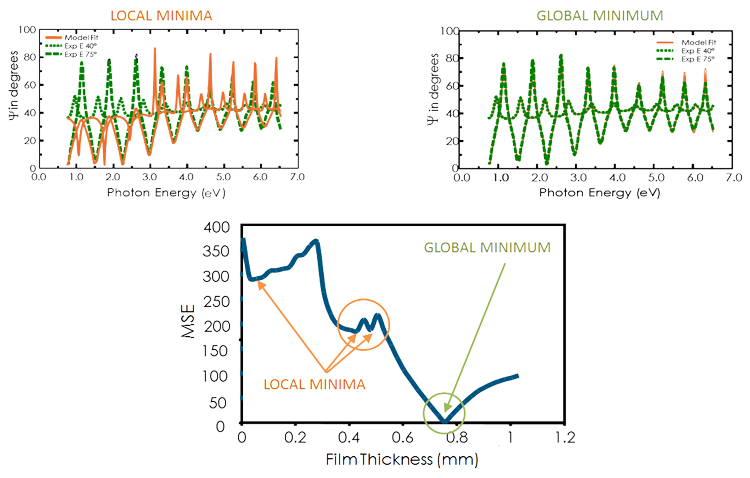 The phase information from Δ is very sensitive to films down to sub-monolayer thickness. 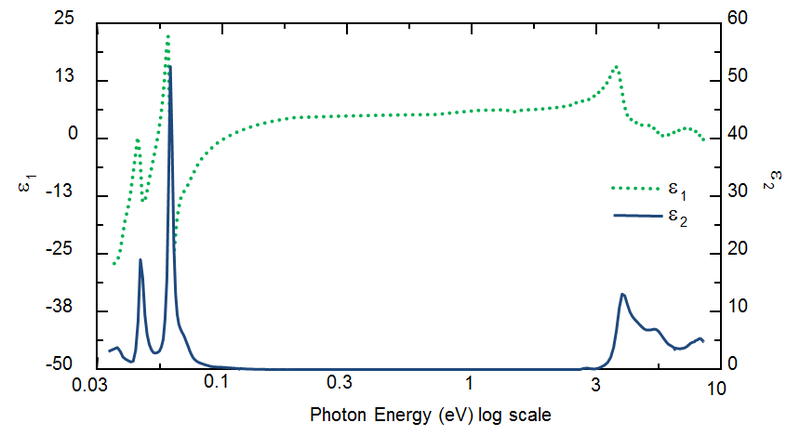 The figure below compares reflected intensity and ellipsometry for the same series of thin SiO2 layers on Si. There are large variations in Δ, while the reflectance for each film is nearly the same. (left) Reflected intensity and (right) ellipsometric delta for two thin oxides on silicon show the high sensitivity of Delta to nanometer scale films not observable with the intensity measurement. Ellipsometry is typically used for films whose thickness ranges from sub-nanometers to a few microns. As films become thicker than several tens of microns, interference oscillations become increasingly difficult to resolve, except with longer infrared wavelengths. Other characterisation techniques are preferred in this case. Thickness measurements also require that a portion of the light travel through the entire film and return to the surface. If the material absorbs light, thickness measurements by optical instruments will be limited to thin, semi-opaque layers. This limitation can be circumvented by targeting measurments to a spectral region with lower absorption. For example, an organic film may strongly absorb UV and IR light, but remain transparent at mid-visible wavelengths. For metals, which strongly absorb at all wavelengths, the maximum layer for thickness determination is typically about 100 nm. 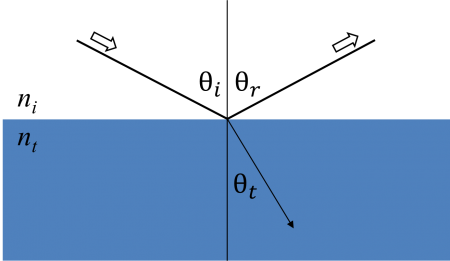 Thickness measurements are not independent of the optical constants. The film thickness affects the path length of light traveling through the film, but the index determines the light waves’ velocity and refracted angle. Thus, both contribute to the delay between surface reflection and light traveling through the film. Both n and k must be known or determined along with the thickness to get the correct results from an optical measurement. The optical constants for a material will vary for different wavelengths and must be described at all wavelengths probed with the ellipsometer. A table of optical constants can be used to predict the material’s response at each wavelength. However, it is not very convenient to adjust unknown optical constants on a wavelength-by-wavelength basis. It is more advantageous to use all wavelengths simultaneously. A dispersion relationship often solves this problem, by describing the optical constant shape versus wavelength. The adjustable parameters of the dispersion relationship allow the overall optical constant shape to match the experimental results. Compared to fitting individual n, k values at every wavelength, this greatly reduces the number of unknown “free” parameters. where h is Planck’s constant and the wavelength, l, is given in nanometers. More advanced dispersion models, like the Tauc-Lorentz and Cody-Lorentz, will include terms to describe the bandgap energy.